What more should I say…there were lot of pros and cons for us when deciding whether to sign up for an activity like that (not particularly financial ones). Is it fun for the animals? Do they return any of the money you dash into this institution to the dolphins? Is this company on PETA’s shitlist? Do I f@ck up my karma if I give in to a popular tourist attraction? At the end, we gave in, for sole hedonist reasons (why not while we have the chance). 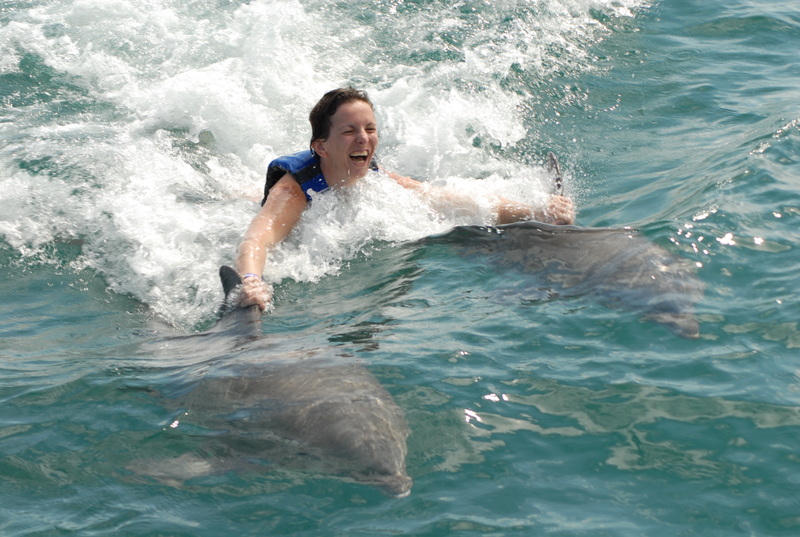 You might ask yourself how fun it is to splash around with dolphins kept and breed in captivity and how realistic this experience is in comparison with swimming with wild dolphins. The fact is that wild (untamed) animals don’t swim with you, as it is their natural instinct to keep away from you as a human, so looking for realistic experience is a major fail. 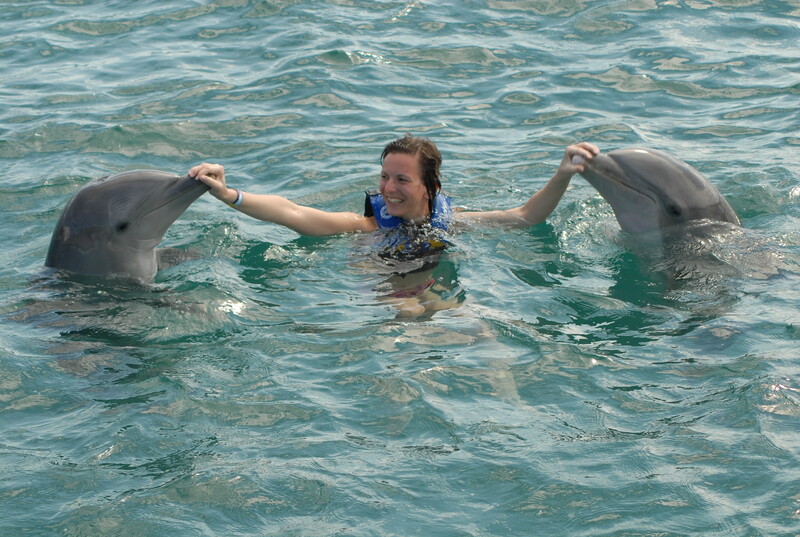 However, interacting with mammals is fun. It is also fun to see how tamed animals misbehave and do whatever the f@ck they like. Many times when the trainer sent out the dolphins to do some tricks, they just thought they would swim by their pals and hang around there and then come back for some treat / anchovy. In those cool / naughty dolphin moments I marveled at the bright mind of these gorgeous mammals, who know what they supposed to do or don’t do in certain scenarios, but every now and then they practice free will and do whatever they like. It seems we are very alike. I would endlessly consider all these issues before giving my money away to this institution. And even after deciding to do so, I would miss the enjoyment just thinking about all the mistreatment and animal rights issues. That’s what happened when I went on a camel safari in Jaisalmer, India (post later). I am very glad you actually enjoyed this wonderful experience. You look so good in the pictures, so happy! It’s tough to live this modern life and have to think about SO many issues all the time. Are you a member of any animal rights organization? I’ve been thinking about joining Djurensrätt. I am not yet a member of animal right organizations, but I tend to give away to organizations helping animal rights or promoting the cause of animals on the verge of extinction.